Abruzzo region is the perfect destination if you are looking for nature, mountains and off the beaten path places. It is located on the Italian eastern coast and borders Le Marche to the north, Lazio and Campania to the west, Molise to the south. You can get easily there from Rome. Within the region you find some enchanting places and historic towns. Abruzzo is known for the excellent food: you have not to miss Arrosticini, the symbol of this region. Today we will introduce you Chieti. You can reach this town landing at Pescara airport and then taking a bus or renting a car. Chieti is about 20 km far from Pescara. It dates back to earlier Roman time. There are various legends about this subject. The most famous is the one which relates that Teate, the ancient name of the city, was founded by Achille, the Greek hero. He called the city Teate in honour of his mother. The termal bath built during the Roman time. You can admire this hero on Chieti’s coat of arms, on top of a prancing horse whilst holding a lance and a shield. On top of this shield is a white cross on a red background with four keys that symbolize the four doors of medieval Chieti. Around the 90 B.C. Chieti, after various battles against Rome, joined forces with Rome and from then on followed a golden age, indeed, it became a municipality. Several public buildings were erected: a foro (roman tribunal), a theatre with the background of Mount Gran Sasso (today it is possible to see only ruins), an amphitheatre (restored and now used for concerts and events), a water main with underground parts and last but not least, the thermal bath. After the collapse of the Roman Empire, Chieti was destroyed and dominated by several barbarian populaces. With the Longobards it became Chamberlainship and in Aragon period, Chieti was the capitol city of all Abruzzi and it had the right to mint its own money. In the Risorgimento period (1815-1871), several Teatini (inhabitants of Chieti) fought for the unification of Italy and in the end, the city welcomed King Vittorio Emanuele II in 1860 and declared the annexation of Chieti to the Kingdom of Italy. In the WWII Chieti like Paris, Rome, Florence and Belgrade was an “open city” thanks to the Archbishop Giuseppe Venturi. 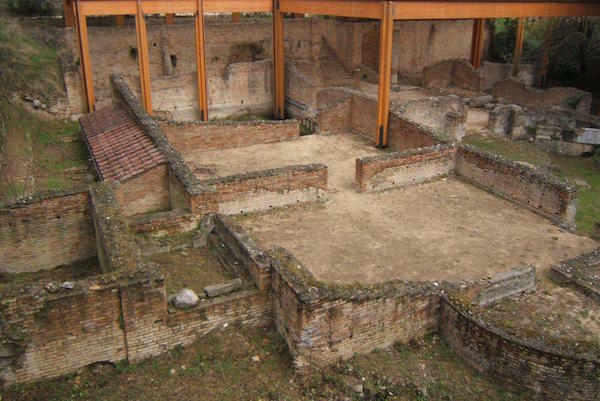 Like other roman cities, between the first century B.C and the second century A.D., Chieti developed an important underground water system, made up of tanks and tunnels for the supplies of the large population of that period. 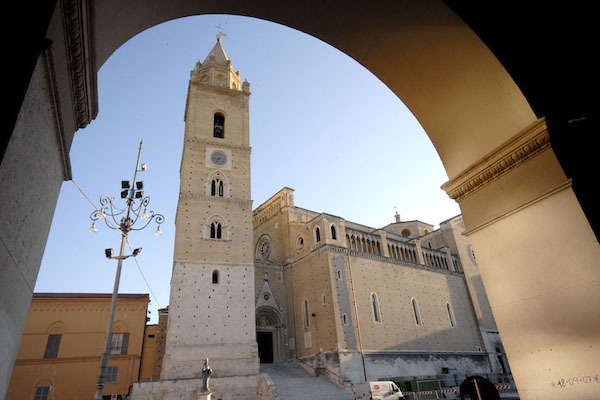 San Giustino Cathedral is worth a visit in Chieti city centre. Nowadays, it is possible to visit part of this underground path guided by the Chieti Speleo Club. Every last Saturday of the month, this association offers a free guided tour for a group of max 15 visitors in the underground tunnel of Via Tecta, which is below the XVII century Mayo Palace. I made this experience and it was exciting to discover a hypogeum tunnel of 45m long and about 4m high. However, part of this tunnel is very small and you have to bend down to walk! In Chieti there are so many things to see owing to the city’s rich history. In addition to the archaeological sites (amphitheatre, thermal baths, underground tunnel and tanks), you can admire the Cathedral, the theatre and various historical palaces and churches. You can admire the wonderful landscape stretching from the mountains to the sea and there are several museums worth a visit: the archaeological museum, situated within the green Villa Comunale, where the famous statue of Guerriero di Capestrano is kept; Civitella museum and Barbella museum. 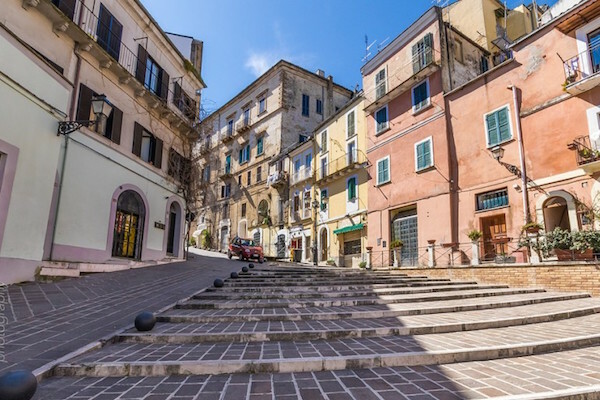 You can stroll along the Corso Marrucino on Friday and enjoy the open-air market or sit down in Vittoria cafe, one of the oldest in Chieti. May is the month of “Maggio Teatino”, almost every day there is something interesting to discover. The 11th of May is Saint Justin’s day, the patron of the city. Throughout that week there are fairground rides for children and concerts at night. The penultimate weekend of May, it’s possible to join the “Festa dei popoli” festival. It is a daylong multicultural festival organised by Chieti citizens together with foreign communities and several religious communities, aiming to discover the traditional dishes from around the world. Last but not least, on the last weekend of May it’s possible to visit vineyards and taste local wines in the “Cantine aperte” (Open Cellars) day. Sagne with chickpeas is the typical dish of Chieti. Located in the historical centre of Chieti. You can savour typical dishes in a warm atmosphere with good service. Good value for money! 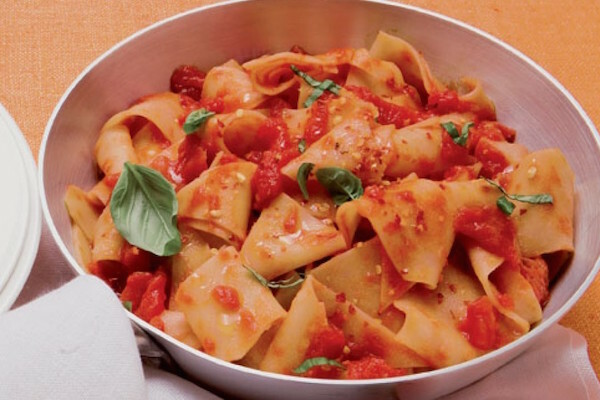 Located on a nearby hill of Chieti, you can find a rustic atmosphere and excellent typical dishes and pizza. Good quality/price ratio! Clicking here you will find a list of where to sleep in Chieti.